REWARD FOR EFFORT (AUS) (Bay 2006-Stud 2011). 4 wins-2 at 2, MRC Blue Diamond S., Gr.1. Sire of 235 rnrs, 133 wnrs, inc. SW Gold Symphony (MRC Vain S., Gr.3), Ability, Brugal Reward, Take Pride, Blondie, Dalradian, Desert Lashes, SP Gratwick, Tuff Bickie, Sheriff John Stone and of Fancy Rumble, Hell of an Effort - D'Great Effort (Mal. ), Jevilla, Montana Star - Star Superior (H.K. ), Petite's Reward, Fully Maxed, Kasi Farasi, The Queen's Reward, etc. OUR GIRL CHARLIZE, by Stratum. 5 wins from 1200m to 2200m, A$161,160, ATC HMAS Vendetta H., Liberty International Underwriters H., Tooheys New H., 2d ATC Michael Seach H., Tab.com.au H., Styletread.com.au H., 3d ATC Vale Bob Rowland-Smith H., Randwick Betting Auditorium P., Rose of Mooncoin H. Half-sister to I Command, I'm No Phony. Dam of one named foal, one to race. I Command (Commands). 8 wins-1 at 2-from 1000m to 1600m, A$359,975, MRC Baryshnikov H., New Gleam H., WATC Brechin Castle H., EO Norton Memorial H., Swinging in the Saddle H., Carlton Mid H., Redback Cristal H., 2d Bunbury S., L, WATC Easter S., L, MRC Dennis Hanrahan H., Geoffrey Bellmaine 2YO H., 3d Kalgoorlie Boulder RC Boulder Cup, L, VRC Anzac Day S., L, WATC Northerly S., L, Cyril Flower S., L, 4th VRC Gibson Carmichael S., L.
I'm No Phony (California Dane). 3 wins at 1000m, 1400m to 2016-17, 3d ATC Breeders' P., L.
Our Girl Charlize. 5 wins. See above. Turn the Tide. 4 wins to 1400m, AJC Carlton H., STC Book Now for Golden Slipper Festival H., 2d AJC Randwick Betting Auditorium H., 3d AJC Liverpool Leader H.
Zaphod. 6 wins from 1000m to 1600m to 2017-18 in Aust. Eyezoff. 2 wins-1 at 2-at 1250m to 2016-17 in Aust. Wallachia. 2 wins at 1400m, 1600m in Aust. Dark Mirage. 2 wins at 1400m, 2000m in Aust. Cut Through. 3 wins from 1300m to 2400m, 2d MRC Palfresco H.-twice, 3d MVRC Jayco Bay Classic H.
Great Effort. 3 wins from 1900m to 2050m in Aust. Sweet Spot. Winner at 2200m in Aust. Producer. MAXIMUM EFFORT (Shy Rambler). 4 wins. See above. PENTACITY (Pentire). 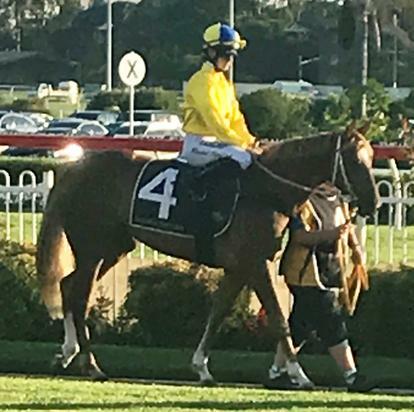 3 wins from 1400m to 2000m, A$206,900, Gold Coast Bracelet, L, BTC Northside Roofing H., QTC Avondale P., 2d BTC Doomben Roses, Gr.3, QTC Princess S., L, Romantic Dream H., 3d BTC QTIS 600 H., Logan Chamber of Commerce H., QTC Hidden Dragon H., BTC John Barnes & Co Locksmith H. Producer. The Fire Inside (Sir Percy). 3 wins at 1600m, 2100m, 2d ARC Dunstan Feeds Championship Qualifer, Lindauer H., 3d Waikato RC Sir Tristram Fillies Classic, Gr.2, ARC Waste Management H.
ALLERGIC (Street Cry). 8 wins from 1750m to 2400m, A$681,945, to 2016-17, ATC Colin Stephen H., Gr.3, 3d South Australian Derby, Gr.1, ATC Metropolitan H., Gr.1, Sky High S., Gr.3. LUSKIN DANCER (Enforcer). 7 wins from 1500m to 2400m, A$217,045, WATC GA Towton Cup, L, 3d WATC St Leger, L.
OMNICORP (Grosvenor). Second on The 1987-88 Australasian 3YO Classification. 4 wins-1 at 2-from 1000m to 2500m, A$506,150, Victoria Derby, Gr.1, AJC San Domenico S., Gr.2, VATC Norman Robinson S., L, STC Port Hacking View Club 2YO H., 2d AJC Breeders' P., Gr.3, 3d AJC Expressway S., Gr.2, VRC Maribyrnong P., Gr.2, Newcastle JC Penfolds Classic S., Gr.3, VATC Blue Diamond Prelude, Gr.3, Geelong RC Derby Trial S., L, 4th AJC Champagne S., Gr.1. Sire. PHAROSTAN (Imposing). 6 wins-2 at 2-from 1200m to 2400m, A$191,850, VATC Herbert Power H., Gr.2, Sandown Cup, Gr.2, STC XPT S., VATC Pelham H., Tooronga H., 2d STC Hill S., Gr.2, VRC Turnbull S., Gr.2, 3d VATC Eclipse S., L. Sire. ABIDEWITHME (Redoute's Choice). 9 wins from 1200m to 2000m, NZ$416,200, A$63,750, to 2016-17, BOP RC Tauranga S., Gr.2, Cambridge JC Travis S., Gr.2, 2d Te Aroha JC New Zealand Thoroughbred Breeders' S., Gr.1, Cambridge JC Travis S., Gr.2, ARC Westbury Classic, Gr.3, Sofitel Luxury Hotels S., Gr.3, 3d WRC Thorndon Mile, Gr.1, Te Aroha JC New Zealand Thoroughbred Breeders' S., Gr.1. DESTINY'S KISS (Power of Destiny). 17 wins from 1500m to 3200m, A$1,277,218, to 2017-18, ATC Winter Cup, L, 3d ATC Summer Cup, Gr.3. MELT (Iffraaj). 2 wins at 2 in 2017-18, ARC Eclipse S., Gr.3, Counties Challenge S., L.
SUAVITY (Akaaber). 5 wins-1 at 2-from 1200m to 2400m, A$249,280, Tasmanian Derby, Gr.3, MVRC Martin Nettleton H., VATC Beaumaris Hotel & Football Club H., VRC Super VOBIS in 1997 H. Sire. ALWAYS CERTAIN (Not a Single Doubt). Champion Older Horse in Singapore in 2011 (Long). 8 wins from 1200m to 1800m, S$1,230,924, Singapore TC Raffles Cup, L, Committee's Prize, L, 1600m-in track record time. SPLURGE (Savabeel). 8 wins from 1200m to 1600m, NZ$232,300, to 2017-18, Manawatu Challenge S., Gr.2, ARC Darley P., Gr.3, Cambridge JC AON Insurance Brokers H., ARC Shaws Wire Ropes H., Ophthalmic Instruments H., 2d ARC Eagle Technology S., Gr.3, 3d BOP RC Quickcount H., Chesters Plumbing and Bathroom H.
SHOPAHOLIC (Pins). 5 wins-1 at 2-to 1400m, NZ$7,538, A$287,013, MRC Angus Armanasco S., Gr.2, VRC Vanity S., Gr.3, MRC Derrinstown Stud Ireland P., Cove Hotel H., 3d MRC Twilight Glow S., L, BMW H., Waikato RC Iverquantel Juvenile H., 4th VRC Gucci S., L. Producer. PACKING PINS (Pins). 7 wins to 1400m, NZ$82,750, HK$8,586,500, to 2017-18, Rotorua RC Arawa S., Gr.3, 2d ARC Railway S., Gr.1, HKJC Chinese Club Challenge Cup, L, 3d HKJC Champions Mile, Gr.1. SACRED FALLS (O'Reilly). Joint Top Older Male of 2013-14 Australasian Classification (Mile). Top on the 2012-13 NZ 3YO Free H (1200m-1600m). 9 wins-2 at 2-from 1000m to 1600m, NZ$378,435, A$4,400,300, New Zealand Two Thousand Guineas, Gr.1, ATC Doncaster H., Gr.1-twice, George Main S., Gr.1, Hawke's Bay Guineas, Gr.2, Waikato RC James & Annie Sarten Memorial S., Gr.3, Whangarei RC Westbury Stud Challenge S., L, Waikato RC Shaune Ritchie Racing Stables 2YO H., 2d ATC Rosehill Guineas, Gr.1, Queen Elizabeth S., Gr.1, 3d MVRC Schweppes Crystal Mile, Gr.2, 4th ATC George Ryder S., Gr.1, Canterbury S., Gr.1. VONUSTI (Ustinov). 9 wins from 1000m to 1600m, NZ$923,738, WRC Telegraph H., Gr.1, Taranaki RC Energy City Ford H., ARC Brokerweb Insurance Group H., Lindauer Sec H., Sunline Lodge H., 2d WRC Captain Cook S., Gr.1, ARC Darley P., Gr.3-twice, CJC Pegasus S., L, Rotorua RC Lion Red P., L, 3d ARC Concorde H., Gr.2, BOP RC Japan-New Zealand International Trophy, Gr.2, ARC Darley P., Gr.3. JACQUETTA (Keeper). Third Top Filly on The 2014-15 NZ 2YO Free H. 4 wins at 2, CJC Welcome S., L, 3d WRC Wakefield Challenge S., Gr.2. Race Record: 1 Starts 0-0-0 A$1,870.